Zane Benefits, which provides businesses with web-based defined contribution plans and health reimbursement accounts, today announced it had published a free whitepaper named “Health Insurance Exchanges 101” to provide insurance professionals, CPAs and small businesses a simple guide to the new public and private health insurance exchanges. Starting January 1st, 2014, the Affordable Care Act (ACA) requires every state to create health insurance exchanges for businesses, employees and individuals. And, if a state fails to set up the exchanges in time, the federal government will step in. It is important for all U.S. businesses and individuals to have an understanding of health insurance exchanges and what they are. The concept is actually quite simple, and in this quick "101" guide, Zane Benefits breaks down the basics of a health insurance exchange. 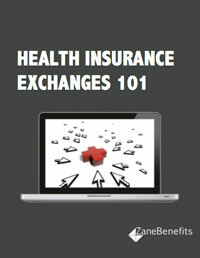 • What is a health insurance exchange? • How does a health insurance exchange work? • What are the different types of health insurance exchanges? • What is the difference between private and public health insurance exchanges? • How do the public health insurance exchanges work in 2014? Zane Benefits, Inc., a software company, helps insurance brokers, accountants, and employers take advantage of new defined contribution health benefits and private exchanges via its proprietary SaaS online health benefits software. Zane Benefits does not sell insurance. Using Zane’s platform, insurance professionals and accountants offer their clients a defined contribution plan with multiple individual health insurance options via a private health exchange of their choice. Learn more at www.zanebenefits.com.